One would never know that Rudy Giuliani was once a fairly moderate mayor of a liberal Northeastern city like New York, judging by the string of controversial comments he’s made recently. A few weeks after saying that President Barack Obama doesn’t love America, during a radio interview Thursday he suggested that Obama is to blame for the severe beating of a girl at a Brooklyn, N.Y., McDonald’s, and the shooting Thursday of two Ferguson, Mo., police officers, the New York Daily News reports. During the interview with AM 970, Giuliani also said that Obama should be more like—wait for it—Bill Cosby. Giuliani was asked to comment on a string of hot-button issues happening in African-American communities, and he tied them all back to “the tone” he says Obama has set. “It all starts at the top. 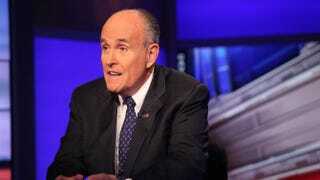 It’s the tone that’s set by the president,” Giuliani said. Giuliani echoed the critics of the #BlackLivesMatter movement, saying that Obama is ignoring “enormous amounts of crime” committed by African Americans and is instead incriminating police officers. Giuliani argued that Obama should be advocating more on behalf of the country’s police officers. “It is the obligation of the president to explain … that our police are the best in the world,” Giuliani said. Giuliani went on to say that Obama should have used his role as president to stop the protests that engulfed Ferguson, and much of the nation, after a white police officer fatally shot an unarmed teen, Michael Brown, in August 2014. And while Giuliani suggested that it’s a shaky reference to make, in light of the sexual assault accusations surrounding Bill Cosby, the former mayor said that Obama should adopt the comedy icon’s conservative views on how black Americans ought to behave. “I hate to mention it because of what happened afterwards, but [he should be saying] the kinds of stuff Bill Cosby used to say,” Giuliani said.